Rick Becker's extensive FSI 2008 Montreal show coverage in now online! With well over 10,000 words filling an impressive 8 web pages, we have many exclusive photos that must be seen! This is among the very best Montreal audiophile show coverage for both those who did and did not attend this event. Sit back, relax, and read about the world premiere product launches and people who make this event a joy to attend. To read Rick report click here. Enjoy the Music.com will be offering our exclusive daily updates to the must-attend show of the spring! Munich's High End Society is presenting their High End 2008 show takes place at Munich's M.O.C. A staggering 18,373 m² (60,278 ft²) of floor space will be filled with everything from vinyl albums to the upper echelons of ultra high-end audio gear. Over 225 confirmed registrations from 24 countries will be represented. A grand total of around 700 brands from Germany and abroad will be seen during this event. Enjoy the Music.com's show coverage can be seen by clicking here. 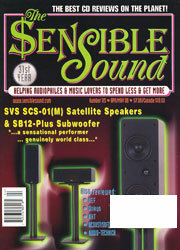 Enjoy the Music.com has posted the April/May 2008 edition of The $ensible Sound magazine. This issue features auditions of the Acoustisoft MP-B-USB Kit and Audio-Technica ATH-A700 plus reviews of the SVS SCS-01 satellite speakers & SB12-Plus subwoofer, KEF Reference 205/2, Onkyo TXSR 705 & TXSR 805 AV receivers and the NHT Classic Four loudspeakers. Within editor David A. Rich's editorial titled Red Faced Rich Again, he says, "This review of the Oppo DV-980H in the January 2008 issue of Stereophile, Kalman Robinson identified some AV receivers as incompatible when playing SACD discs over the HDM link because the subwoofer (0.1) channel is inactive. I did not check for activity in the subwoofer channel and missed the problem. The fix, a response to Dr. Robinson's discovery, is on the Oppo web site where you need to navigate to the Do-It-Yourself Firmware Update Instructions for the Oppo DV-980H, release date of October 9, 2007 or later..." To see this issues entire table of contents and read the complete editorial click here. Ampphion will be having a world first preview of their new Krypton2 (12,800€) full range loudspeaker at the High End 2008 event in Munich. The Krypton2 utilizes a cardioid dispersion pattern to decrease unwanted room reflections and allow one to hear less of the room and more of the loudspeaker. Cardioid dispersion is achieved via large tweeter waveguide and placing the two 8” midranges in their separate flow controlled chambers. The cardioid chambers reduce the energy to the side by 5dB and 20dB to the rear, and allow to midranges to work in nearly open-air conditions. Newly developed midrange drivers made by SEAS utilize a new wood and plant fiber membrane. A newly designed titanium tweeter, also made by SEAS, is housed in a proprietary waveguide. Overall frequency response is from 19Hz to 30kHz with a sensitivity of 87dB/W/m and impedance of 4 Ohms. Driver compliment is a single tweeter, pair of 8-inch ribbed wood and plant fiber cones by Seas and 10-inch Nomex woofers by Peerless. Box dimensions are 1370 x 240 x 470 (HxWxD in mm). A smaller brother to the Amphion Krypton2 is the new Prio 620, with the drivers placed vertically in a WTW format in accordance with their Amphion Time Accurate Point Source (TAPS) system. The Prio 620 is based on 6.5-inch woofer and a new Seas sourced tweeter and it is available in white, black and birch. Also of note is the Prio 510 two-way bookshelf based on the new 5.25 Peerless Nomex driver and 25 mm titanium tweeter. Lastly, Amphion's new Argon2 Anniversary (1680€ in white) is a celebration of their 10th year Anniversary. A newly developed Titanium tweeter, which was developed for the Krypton project, is employed for the uppermost frequencies. It has a slightly modified crossover design as well as Gold plated WBT binding posts. Argon2 Anniversary is available in white, black, birch and cherry. Holfi will have a world premier of their new Batt2riia (2150€) next generation battery powered MM/MC phono preamplifier at the High End 2008 show in Munich. The Batt2riia combines unique features including battery power and current amplification. This combination is said to achieve extraordinary low noise level and audiophile sound quality far beyond it's price tag. This second generation Batt2riaa is a further development of the original, now with a larger and more refined power supply and larger batteries. It also contains the WBT Nextgen RCA connectors. Normally, phonostages are voltage amplification designs, and at Holfi they work with the fact that transistors are by nature a current amplifying device (unlike tubes or FETs). According to the company, using them in accordance with their nature gives several advantages: The transistor produces much less distortion and less noise. Because of their low internal impedance MC cartridges deliver a quite potent current signal, much higher than a typical MM cartridge. As all other Holfi electronics the Batt2riaa is a single ended design and totally without global feedback. Overall frequency range is a super wide 2Hz to 1.3MHz with an RIAA accuracy of +/- 0.2 dB. Linn has once again put forth their vinyl expertise as the company's new Majik LP12 ($3750) turntable combines decades of analog engineering! Combining the legendary 35 year old LP12 performance at lower entry fee, the Majik LP12 consists of an internal Majik LP12 power supply, solid base board, Adikt MM cartridge and Pro-Ject 9cc tonearm. Like the original LP12, the Magik LP12 performance can be further improved over time by upgrading the turntable with any one of Linn's range of turntable accessories, such as a Lingo external power supply, Keel sub-chassis and armboard, Akito tonearm, Klyde cartridge, and Trampolin base board. "The Magik LP12 lets even more music lovers access Sondek performance from their cherished vinyl; it's also fully upgradeable and can improve any Hi-Fi system." said Ivor Tiefenbrun MBE, Founder and Chairman of Linn Products. "It's fantastic that after thirty five years, not only is our first product still going strong, but more people than ever are continuing, resuming or just starting an enduring love affair with the LP format." The Magik LP12 is available in various woo and solid colors. 05/2004 Linn has done it again with a successful partnership with critically acclaimed automobile manufacturer Aston Martin to offer audio systems within their vehicles. First came the Linn entertainment system within the V12 Vanquish approximately a year ago, and today they extend their products to be offered as standard within Aston Martin's new DB9. The Aston Martin DB9 does produce a mere 450bhp from their 6-liter V12 engine. Fitted as standard in the DB9 includes Linn's 128W Audio System that consists of a 5-channel stereo amplification and loudspeaker solution. Four 22 wpc. amplifiers, developed from Linn's latest ultra-linear CHAKRA technology, drive two loudspeakers situated in stereo configuration in the vehicle's doors. Each of these active loudspeakers contains a 4-inch mid-range drive unit and a 1-inch tweeter. An additional 40-watt amplifier drives the 8-inch bass reinforcement loudspeaker which is situated between the rear seats. The Linn 260W Audio System is the mid-level option in the range, offering greater power and the addition of Limbik-powered surround sound, delivering superior sound and tuneful performance that is simply totally involving. Surround sound processing in the Linn 260W System is handled by Linn's proprietary Limbik software algorithm which converts a normal stereo signal into 6 discrete channels of pitch-accurate sound, immersing the driver in the performance. Those seeking the best package available will opt for Linn's 950W Audio System with reference quality Chakra amplification powered by Linn's proprietary Switch Mode Power Supply technology resulting in substantially greater power output and improved sound quality with ten channels of 75W driving the active full-range loudspeakers and an additional 200W driving the active bass reinforcement loudspeaker. This system also has servo-controlled bass reinforcement loudspeakers using an accelerometer to provide the correct feedback required for pitch accurate performance down to the lowest frequencies. On an updated side note, Aston Martin now chooses Band & Olufson for their in-car audio system. 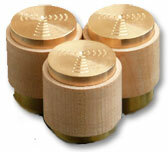 Tonian Labs now offers the ultimate decoupling resonators, the UCDR ($495 for set of three), which are are designed to work under CD-players, amplifiers, preamplifiers and loudspeakers. The company claims that energy is transferred to a single point, this way the whole system will resonate on a single point in one frequency and that way there will be more focus for the reproduced music. Basically, the way they work is by taking the vibration energy to a single point, which is more like putting your equipment on top of a needle. Each unit is made with a combination of bronze, brass, and wood. Electrocompaniet, a Norwegian manufacturer who recently acquired Nordic Tone, will be introducing their new Prelude Maestro high-end home entertainment center at Munich's High End 2008 event. This all-in-one system from Electrocompaniet includes amplifiers, tuner, CD, SACD and DVD player integrated into one unit that fits easily into any modern interior. The Class AB amplifiers produces three channels of 120 watts, while the DVD player includes upscaling to 1080P and has HDMI output. The new DAB radio system and a selection of functions can be installed in the available expansion slot. 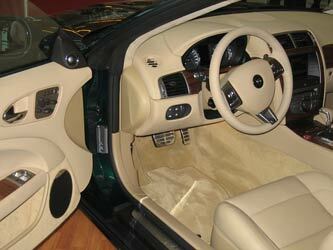 As an option, users can add wireless rear amplification consisting of two channels at 75 watts each. This allows for full 5 channel surround sound. 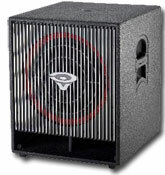 A pair of self-powered subwoofers can be connected to the Prelude Maestro. As for, Nordic Tone, the company has been acquired by Electrocompaniet including all patents, products and rights to the Norwegian loudspeaker projects. Internationally acclaimed and leading Internet specialty audio and music review Web site Enjoy the Music.com has launched their MusicGiants Concierge Collection Contest! In the past three years well over $135,000 in prizes have been offered; with each one creating a huge buzz throughout the audiophile community. In concert with MusicGiants, Enjoy the Music.com will be awarding $250 worth of DRM-free music to an opt-in Mailing List member residing within the United States of America. "Right on the heels of ending the over $41,000 equipment contest, it brings me joy to announce this special gift of music to a lucky member of our readership. As the only online audiophile magazine with the resources and support to have the opportunity to offer over $135,000 in prizes in the past three years, it brings me great pleasure to give away a wonderful collection of music specially chosen for the contest winner." said Steven R. Rochlin, editor of Enjoy the Music.com. "Our relationship with MusicGiants strongly shows how consumers desire high-resolution music versus the lower quality compressed music files offered by other online music vendors. Our critical readership expects no less than acquiring the very best, and this is precisely why Enjoy the Music.com is working with MusicGiants." The contest begins April 21, 2008 and will end May 31, 2008 with the winner being notified via e-mail. MusicGiants' online store for Enjoy the Music.com can be seen at this link. To learn more about the contest and enter to win click here. In November 2007 Enjoy the Music.com launched their third annual Equipment Contest with thousands of dollars in audiophile products to be given away! This contest marks a combined total of over $135,000 in prizes having been offered by Enjoy the Music.com. With the first round of winners chosen in early April, and a subsequent second round on April 15th, lucky Mailing List members who have been awarded a prize appear below. A third round of deciding new winners from the remaining unclaimed prizes will be chosen in a few weeks. To learn more about this most recent equipment contest click here. 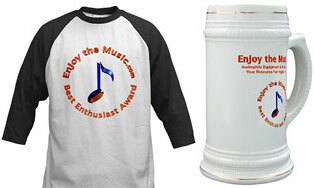 If you are not already a member of the Enjoy the Music.com Mailing list and want to enter our contests, click here. Barry Paulson: HiFi-Tuning "suite" of products including their RFI and EMI "Noise Destroyer" (MSRP $249.95), and their choice of three HiFi-Tuning Silver/Gold upgrade fuses (MSRP $29.95 to $39.95 each). Prize package worth up to 369.80 depending on fuse choice. Baidu, the leading Chinese language Internet search provider, faces a potential multi-billion dollar liability for breaching music copyrights according to the International Federation of the Phonographic Industry (IFPI). The IFPI, an organization that promotes the international recording industry worldwide with membership including over 1400 companies in more than 70 countries, claims that a Chinese court has agreed to hear damages claims totaling $9 million USD from three record companies. The claim is the tip of the iceberg in a copyright infringement test-case that could expose the Chinese internet giant to a multi-billion dollar liability. According to the IFPI press release, "Baidu's music delivery services, which are quite separate from its general search engine, "deep link" users directly to hundreds of thousands of copyright infringing music tracks. They generate substantial advertising revenue for Baidu while causing massive damage to the music industry... The record companies' infringement claims against Baidu are based on 127 of their own music tracks, which are just a small representative sample of the wider infringement. They seek the maximum statutory compensation under Chinese law of RMB 500,000 ($71,000 USD) per track. This creates total claims of RMB 63,500,000 ($9m USD) but the ultimate exposure could be much greater." To date, China's Internet companies have chosen not partnered with the recording industry and instead are facilitating mass-scale piracy on their networks. While China has a huge potential as a legitimate digital music market, with more broadband connections than the United States plus huge music-buying demographic, over 99 per cent of all music online in China infringes copyright. Channel D has released Pure Vinyl 2.2 a free update to their suite of audio applications designed especially for the high quality digital playback and transcription of vinyl LP records. Pure Vinyl 2.2 ($229 for the Mac OS X 10.4 and up) is a suite of audio applications designed especially for high-resolution digital playback, editing, and archival of vinyl records. It includes real-time playback monitoring, recording of dry or equalized audio at sample rates up to 192 kHz (with simultaneous save of CD format audio), adjustable sample rate conversion, and many other features. Pure Vinyl uniquely combines a fun "scratch" style grab-and-spin editor with realistic "virtual vinyl" platter images, rendered from the audio. The editor's automatic gain riding and looping insures accurate track editing, even in the presence of vinyl background noise. A high quality resampling feature simultaneously saves CD format audio while monitoring and recording raw or equalized audio at sample rates up to 192 kHz. Editing operations are nondestructive, and real-time, 64-bit vinyl correction (choose from dozens of customizable curves for antique recordings, or a highly optimized, extremely accurate standard RIAA curve) is included. This free update includes improvements to the editor and recorder plus updated documentation. 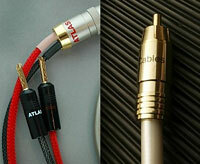 Atlas Cables, a Scottish specialist in cable manufacturing with design developed by John Carrick, offers many lines from their Atlas Basic interconnect all the way up to the Atlas Ascent 3.50 loudspeaker cable (priced at £35 to £95 per meter respectively. The Atlas Basic features asymmetrical / unbalanced double shielded multi-stranded wire that is 99.9997 percent pure OFC copper. The outer shield provides 100 percent coverage to avoid unwanted RFI. Special low loss foamed polyethylene dielectric is also part of this design as is soft PVC jacketing. Atlas Cable's Ascend 3.50 loudspeaker cable features 3.51 sq mm rope lay 99.9997 percent pure OCC copper multi-stranded conductors. They are arranged in a twisted fashion to avoid the adverse effects of EMI and give increased resistance from proximity effect. Very low loss Teflon dielectric and a bed of cotton yarn cuts out microphony of this 9.8 mm diameter soft PVC sleeve cable. Karan Acoustics, a Serbian brand distributed within North America by Westside Music and Cinema, has introduced the KA L linestage and KA M 650 monoblock amplifiers ($8490 and $32,000/pr. respectively). The KA L is a one box linestage with extraordinary attention to detail that includes a fully balanced, dual-mono architecture, remote control, feedback reducing feet, and 3 separate power supplies. Inputs include a balanced XLR connection, as well three single-ended RCA types which are translated into fully balanced circuits. Outputs include both single-ended and balanced connections. The KA M 650 monoblock amplifiers feature fully differential DC coupled and zero feedback circuitry with balanced or single-ended inputs. In each 50 kg unit, a pair of 960 VA toroidal transformers and 132000 mF of ultra-fast reservoir capacitance feed a sophisticated ring emitter bipolar output to produce a total of 650 watts into 8 Ohms, and 900 watts into 4 Ohms. Frequency response is from DC to 300kHz with a S/N ratio better than -120dB and damping factor better than 10,000 into 8 Ohms. Custom Electronic Design & Installation Association (CEDIA), an international trade association of companies that specialize in designing and installing electronic systems for the home with more than 3,500 member companies worldwide, seeks a new Chief Executive Officer (CEO) a handful of months after they mentioned and then cancelled aspirations of adding a second industry show to their schedule. The new role also comes after CEDIA claims they are self-managed and independent of Raybourn Group International. The current staff, including Don Gilpin as the executive director, will continue in their present roles and will implement strategic initiatives and events for CEDIA members and the industry. "Just as the electronic systems industry is experiencing explosive growth, so too is CEDIA as the premiere organization representing it," said Don Gilpin. "This expansion of our team will be of great benefit so that I can focus on the internal tasks of running the association, while the CEO can drive the external affairs of CEDIA." 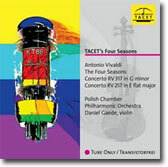 Germany's audiophile recording label TACET has released Vivaldi's Four Seasons [CD No. 163] and the Welte-Mignon Mystery Vol. IX [CD no. 159]. Antonio Vivaldi the Four Seasons recording also includes Concerto RV 317 in G minor and Concerto RV 257 in E flat major as performed by the Polish Chamber Philharmonic Orchestra. With Daniel Gaede on violin, the label proclaims "technical perfection" and a very promising overall performance. The Welte-Mignon Mystery Vol. IX with Camille Saint-Saëns includes all his 1905 interpretations. Selected works by Saint-Saëns, Beethoven, Schumann and Chopin highlight this release. This historic recording is a must-have for those seeking to complete the collection and musical knowledge. Enjoy the Music.com now offers our April midmonth Review Magazine update featuring show coverage of Montreal's FSI 2008 plus Part III of Digital Music On Hard Formats Is Almost Dead! Phil Gold's report on the sights and sounds at this Canadian show includes four web pages filled with new products! Meanwhile editor Steven R. Rochlin continues his viewpoint concerning physical music formats and how it has evolved to high resolution digital music downloads. In his article, Steven writes, "i envision the next step being a $5 or so fee for monthly music subscriptions. All the music you care to download for an additional fee that will be processed by your Internet Service Provider (ISP). There will come a time when all the DRM, lossy compressed music downloads and other limitations will be replaced by monthly subscriptions. The music you have downloaded will play is virtually all computers and portable media devices." See the April midmonth edition of our Review Magazine by clicking here. Accustic Arts new stereo Tube-DAC II high-end audiophile digital-to-analog converter features a tube-hybrid concept and 32-bit processing. The company feels that advantages of going hybrid includes high impedance, high bandwidth and very low distortion. The design allows for ease of tube replacement without the need for bias adjustments. On the digital side, unique 2 x 32 bit technology processes the right and left channels separately and with a high precision crystal oscillator. Accustic Arts' 32 bit digital filter (including 'de-emphasis' technology) ensures high precision while 26 parallel working multiplier processors (32 bit) ensure accuracy. The front knobs are of the premium quality rotary variety made in Germany with gold-plated silver contacts for the input selection. The power supply features a pair of magnetically shielded, encapsulated toroidal core transformers that are also made in Germany. Audiophile music label Chesky Records has joined the many recording labels to offer high resolution music for sale online! The press release says, "As you probably know, with record stores closing it has become increasingly difficult to find quality music. For several years, we have been developing a better way to deliver great sounding records to serious music lovers, and would like to personally extend an invitation to test drive the latest evolution in high-definition music." For now their music is available through HDtracks and allows for music download in the CD-quality AIFF and FLAC, as well as 320 kbps MP3. In the near future, select titles will be offered as DVD-Audio quality 24-bit/96kHz. All files are DRM-free so users can play them in virtually any home or audio file player. Those planning to attend the upcoming Munich (Germany) High End Society's High End 2008 event from April 24th through the 27th are invited to enjoy many special events. Germany's Audio magazine, not to be confused with the now defunct American magazine that went under the same nameplate, will allow interested listeners to gain an (acoustic) idea of how an analogue signal from a professional tape recorder sounds when compared to high resolution digital signals from the same tape. CD, SACD and network players will be available for playing high resolution, uncompressed music signals in 24-bit/96kHz format from hard drives. Lossless, fully digital playback will be demonstrated on an iPod. In another conference, Pino and audio manufacturer Bösendorfer will have Ludwig Flich entertaining recordings with some amazing and strange sounds. At the Technology stage will be conferences including "The question: Do the audio test hits from yesterday still stand the test of time for audiophiles today?" Sound engineer Heinrich Schläfer answers the question in two workshops on the technology stage on Friday and Saturday. Using the audio route sampler, he exposes the tricks used by sound engineers in the past to create their audiophile 'Zeitgeist'. Another conference is 30 Years Of Hi-Fi Measuring Technology, as an experienced measuring laboratory manager talks about thirty years of hi-fi measuring technology. There will be more conferences and many live music events during High End 2008 and editor of Enjoy the Music.com, Steven R. Rochlin, will be providing daily update blogs from this event. To see Enjoy the Music.com's coverage of High End 2008 click here. The Consumer Electronics Association (CEA), a trade association promoting the United States consumer electronics industry, has forecasted that in 2008 their entire industry will generate $1.4 trillion in direct business activity. They will also be employing more than 4.4 million Americans while directly and indirectly producing $2.6 trillion in output and supporting 15.4 million jobs. Membership in CEA has quadrupled in the past three years, making CEA the most respected and recognized source for information, support and tools in the CE industry. Despite the current worldwide economic condition, the organization claims that the CE sector "remains a vibrant and critical part of the U.S. economy. It demonstrates how the United States can create new jobs and remain a viable competitor on the world stage in the face of international competition." While manufacturing of many consumer electronics products has moved abroad, domestic employment in industries supplying content and services for these products has risen. International trade and technological advances have improved the quality and variety of consumer electronics products available and lowered prices. This new study, in concert with PricewaterhouseCoopers, measured the United States economic contribution of companies in the CE sector. Overall, 2008's economic activity translates into a direct contribution of $585 billion by the CE sector to United States gross domestic product 9GDP) and accounts for 4.6 percent of the entire national economy. To read the entire report click here. 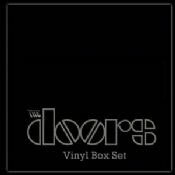 Doors fans will be happy to know that a seven album, 180 gram vinyl box set of their releases is now in production! Of note is that the original engineer, Bernie Grundman, has taken part in transferring the original master tapes to 24-bit/192k digital files. After transfer, the engineering team 'cleaned up' the sound and then employed Bernie Grundman's vacuum tube console and tube cutting lathe to produce this box set. While all six Doors stereo albums are included, the seventh album is a mono version of the band's initial release. Great care has been taken to produce exact replicas of the original artwork, packaging, inner sleeves and mixes. Pricing for the seven LP box set will be £130 in Europe. Olive Media introduced a complete home audio solution, the OPUS No4 ($1,499 to $1,799), which provides music lovers with an easy to use, convenient way to enjoy high-quality sound in every room of your home. The OPUS No4 digital music servers can store up to 3,000 CDs in original CD quality, with multiples more depending on the compression rate chosen. Music stored on the OPUS No4 can be accessed and played anywhere in the home with Olive's new MELODY No2 ($599), wirelessly and in up to ten different rooms simultaneously. Both the OPUS and the MELODY come with a high-resolution color touch-screen and an innovative new interface to allow users to quickly and conveniently find the right music. Olive units handle HD Music at 24-bit/94kHz, wav, flac and mp3 files. The wireless system is a gigabit Ethernet / 802.11g Wi-Fi (supports WEP and WPA encryption up to 128-bit), while a USB 2.0 port plus analog audio outputs are included. Becoming available later this year is an Apple iPod interface. Cerwin-Vega, a leading manufacturer of loudspeakers and audio products, offers their Active Series CVA-115 ($1049) active subwoofer. Much like its predecessors, the CVA-121 and CVA-118, the new CVA-115 features Cerwin-Vega driver design and small compact footprint. A built-in 700 watt amplifier provides a completely integrated active system while a functional cast aluminum grill doubles as a heat-sink. Users can customize the sound via controls including a sweepable low pass filter, a 4-position high pass filter and a Master/Slave mode providing easy set up of multiple units. Maximum SPL is an amazing 131dB while the frequency response is from 41 Hz to 135 Hz (-3dB). Mike Newman, Cerwin-Vega's Director of Product Management, said "The CVA-115 rounds out our active subwoofer series which also includes our 18-inch and 21-inch subwoofers. We decided to create a compact model to meet the needs of Cerwin-Vega customers who demanded a smaller form factor." Online music is now king as Apple's iTunes is ranked as the number one United States retailer, as based on the latest data from the NPD Group. This data is based on the amount of music sold during January and February 2008. How big is iTunes you ask? How does a staggering 50 million customers in total paying up for over four billion songs. Of course with your local brick and mortar store's ever-dwindling physical media stock, iTunes has over six million songs available 24/7 for your shopping pleasure. "We launched iTunes less than five years ago, and it has now become the number one music retailer in the world," said Eddy Cue, Apple's vice president of iTunes. Of course audiophiles demand something less lossy compressed, and so MusicGiants may be their choice for high-resolution music. As a disclaimer, Enjoy the Music.com is partners in offering MusicGiants downloads and while some downloads have DRM, hopes are to make the entire catalog DRM free in the coming months. In other online music news, MySpace will soon launch their music service. Participating labels include Sony BMG, Universal Music Group and Warner Music Group, while EMI Music Group may join in shortly. As for physical media, no crystal ball needed as Q1 2008 sales within the United States have fallen 10.7 percent. Selling 104.5 million units, according to Nielsen SoundScan. The decades old compressed audio CD format, as most engineers record music well over the 16-bit/44kHz standard, saw sales reduced by 16 percent during the same period. Of course music downloads experienced double-digital growth, reaching a 28.7 percent climb. 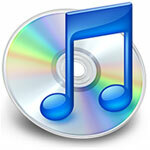 Is it time to kill the CD format in exchange for high-resolution digital download, only you can decide. Enjoy the Music.com's FSI Expo 2008 show coverage has begun. We have Phil Gold's first installment now online, with more repots coming soon! FSI Expo was held in Montreal, Canada, and offers various consumer electronics on display including high-end audio. See our FSI Expo 2008 show coverage by clicking here. No need to wait for the 2008 Munich High-end Society show report to see the new Jaguar or VW top line car audio system as Enjoy the Music.com has complete photos of these systems within our 2007 report (click here). Enjoy the Music.com's 2007 High End report includes the nearly secret BMW in-car demo! A live violinist playing music was being fed directly to the car's 9-channel, 16-driver audio system that features Eton drivers and Learl amplification (825 watt total). This system appears in 2008 BMW 3, 5 and 6 series cars and can be seen within our High End 2007 report. Pelotone now offers their SK-EX Electrostatic Excluder ($500) designed to remove unwanted static electricity, which can be very detrimental to components. Turntable owners know that static electricity can cause loud snaps and pops due, and so the SK-EX can completely remove electrostatic charges from analog discs (LPs). Other benefit can be had for all digital formats (CD, SACD, DVD-Audio, etc) and the unit can also be used for audio cables. The enclosure is lined with patented Thuderon felt which suppresses electrostatic build-up. The unit is large enough for up to five digital discs or one LP. Bowers & Wilkins, manufacturer of high-performance loudspeakers for home audio and home theater systems, will be showing their sweet looking Zeppelin audiophile grade powered loudspeaker system for the Apple iPod ($599) at the upcoming High End 2008 show in Munich! Dubbed the 'Zeppelin' due to the visuals, this a one-piece amplified loudspeaker system and docking station is nearly two feet wide with a dramatic tapered shape and beautifully finished in polished stainless steel. The tapered ends house the midrange and tweeter drivers in much the same way as the famous "pods" of Bowers & Wilkins' 800 Series. Each pair of midrange and tweeter drivers is spaced as far as possible to left and right to maximize stereo separation. Low frequencies are handled by a single five-inch subwoofer located in the center, its bass performance enhanced by the twin rear-firing ports. Three channels of amplification (50 watts for woofer, 25 each for the upper range drivers) each incorporate proprietary DSP (digital signal processing) tailored to fine-tune response of the five drivers. The Zeppelin design incorporates famous Bowers & Wilkins design elements such as its renowned aluminum-dome tweeter and Nautilus tapered-tube tweeter-loading technologies. The passive crossover circuits feeding the midrange and tweeter drivers employ such audiophile grade components as film capacitors and air-core inductors for dynamic, low-distortion reproduction, while Zeppelin's glass-fiber midrange cones are distinguished by critically positioned slots filled with resonance-absorbing compounds, developed using sophisticated laser-interferometry and computer-modeling techniques. Zeppelin is world-ready, automatically accepting any AC power standard from 100V to 240V and its smart 30-pin docking port accepts latest-generation iPods without requiring an adapter or interchangeable bases. Zeppelin comes complete with a pebble-like, mini remote handset to provide even more convenient control of volume, source select and mute, working seamlessly with the iPod to command its play/pause and track-selection functions. When docked, the iPod also accesses a special Zeppelin "Speaker" menu, with five-position bass EQ to tune response for system placement or individual preference. Zeppelin's rear S-video and composite-video outputs deliver iPod video to a big screen, and a combination analog/digital mini-jack input offers Zeppelin playback of virtually any non-iPod audio source. Also included is a dedicated tilt-base, to place the Zeppelin at the acoustically ideal angle for seated or standup listening. See the Enjoy the Music.com review Bowers & Wilkins 800D by clicking here. Wavelength Audio, longstanding manufacturer of top quality vacuum tube amplification and USB DAC products for computer audio, now offer their Crimson USB DAC with upgradeable DAC module and DHT outputs (from $7500 on up depending on configuration). The Crimson is unique in that it is completely programmable from the USB side, with computer code for this process being housed on the DAC module. Each module can completely change the characteristics of the Crimson's ability to transform a digital signal to analog sound. Also of note is that the Crimson uses Directly Heated Triodes (71A, WE101L/M and RE134) as the output tubes while a 6V4 tube rectifier powers the high voltage. While the standard unit is extremely impressive, owners can choose various upgraded including a Silver upgrade ($7500), volume control ($750), WE101L/M +3dB output ($750), and/or Telefunken RE134 +5dB ($1000). Enjoy the Music.com has reviews available online for the Wavelength Audio Duetto stereo amplifier (click here), Brick USB DAC (click here) and Cosecant USB DAC (click here). Torus Power, a specialist in power filtration, offers their Custom Installation Series wall mounted units for audiophiles and videophiles who desire clean power without the need for a large box within their room. Available in four versions ranging from the WM 45 that handles 45 Amperes to the WM 100 that handles 1000 Amperes, these units are designed for 240 Volt Balanced input (2 x 120V), or 208V input and output standard USA 120 Volt/60 Hz. The box can be mounted on the wall directly next to the main home electrical box and wiring conduit holes are added at installation as required to the bottom and lower side surfaces of the chassis. To ensure the unit stays cool during operation, a thermally activated 95 CFM fan will turn on if internal temperatures reach above 70° C. The top line model WM 100 has a pair of 50A fuses, an input current rating of 40A, and surge suppression that meets IEEE C62.41-1991. Furthermore, th protection operates in series mode and is built to withstand 6000 Volts, 3000 Amperes for 1000 repeats; with clamping voltage of 2 Volts above peak nominal voltage. Noise reduction includes a low pass filter, attenuating noise from 2kHz to 1mHz, with attenuation of 12 dB/decade to 500 kHz. The smaller Wm 45 weighs 145 lbs while the top line WM 100 is 228 lbs. Dimensions of the Wm 100 are 27 x 20.5 x 10.5 (WxDxH). Enjoy the Music.com now offers awesome swag! From hats to t-shirts... beer stein and tote bag, a wide variety of cool products to show your support for the high-end community. As a bonus, if one of our representatives or Secret Agents catches you wearing our swag at an audio show you may receive some free audiophile products! 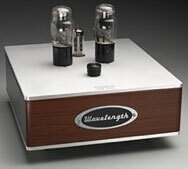 You could receive free music, or tubes... could be cables or excellent tweak devices. Come join us and show your joy of music to the world and perhaps win some cool stuff for your home audio system! To get your share of great products we offer plus have a chance for free audiophile goodies at shows click here. Important News! High-End Audio For All! Government and central bankers finally agree on something! A Tale Of Four Downloads The Future Of The Music Industry? World Premier! Salk Signature Sound SongTower QWT Loudspeaker. Over 15 music albums reviewed including the Mono Maven back in action! See the April Review Magazine by clicking here. Warner Music Group (WMG), one of the leading media companies that own such recording labels as Atlantic, Bad Boy, Elektra, Nonesuch, Reprise, Rhino, and Rykodisc, has proposed that internet service providers (ISP) have each users pay $5 extra per month to access music downloads. This new music subscription format would allow unlimited music downloads, yet there is little other information concerning the resolution of said music files and if they would be protected on DRM-free. WMG feels that this new subscription would bring in approximately $20 billion, some of which would be distributed to artists who create this content. The Electronic Frontier Foundation (IFF), an organization that defends free speech, privacy, innovation, and consumer rights, is among the proponents of a voluntary licensing model where individual users can opt in or out of such a subscription and not be forced to pay the $5 per month. Enjoy he Music.com is in favor of such an optional subscription model provided it offers DRM-free music at the highest bit and sampling rate available by the recording label. Today marks nine years of Enjoy the Music.com providing high-end audio consumer electronic news online! This is the largest and most longstanding of its type available online. Does anyone really read this stuff, and if so, does this available collection mark some type of sad story about Steven and his lack of anything better to do? We asked Steven precisely this question and his response was, "For me, it is important for posting the now daily Industry News, as audiophiles deserve to know the most up-to-date information available. Sure there are mornings where i need an extra pick me up, so a strict diet of a mere 3 hours of sleep, endless candy bars and morning espresso provides the sugar and caffeine rush necessary for my normal 21 hour work day. But hey, the doctor says i have a few good years left in me at this rate. One day Spinal Tap will hire me as their drummer. Yeah, a drummer, that's it, and then maybe next Michael Schumacher will be my driving coach. Well, not like i'd want to hang out with Max Mosley, that guy is a freak! For me, i find that when i get board or need additional stimulation following the above image helps. Eh hem, where was i? Oh yeah, the audiophile Industry News on Enjoy the Music.com. It brings me joy to know that for the past nine years this website has offered Industry News. Users can click the links near the bottom of this page and enjoy the fruits of my labor. Of course in the end what really matters is that we all enjoy the music." Yin Yang Labs now offers version 2.0 of their famous Graphametric Paralyzer! Audiophiles and recording studio engineers worldwide have employed this product as a way to enhance the quality of their music. Version 2.0 furthers the amazing properties of the first unit. Features include enhancing the Transparency of lesser recordings, fine-tuning of Imaging, Harmonics adjustment, and the ever-popular Talent knob. While there may be gifted people who lack the talent, this special feature has been brought to a new high and now can make even the least talented person up to the standards of the major recording labels. Engineers know how strict popular music titles are about using talented people for their latest MTV idol Top 10 pop singers. Enjoy the Music.com has reviewed version 1 of the Yin Yang Labs Graphametric Paralyzer as seen here.